It’s always very reassuring to know that, as Spring follows Winter, and the clocks go forward, there are some things you can always depend upon, even if they remain invisible to our primary senses. But more of that later, for the determining factor at the start of the day was, you guessed it, the weather: and with a forecast easterly of 13kts gusting to 35 kts, and the windsock hanging at 45 degrees, it posed quite a dilemma. Initially, we played it long (when with hindsight we could have profited from some early launches), waiting to see if those gusts materialised – which, truly, it has to be said, they didn’t (the windsock never quite reaching the horizontal all day…) although windspeed did ‘oscillate’ throughout. 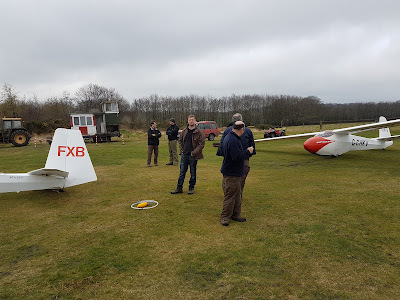 And so by late breakfast, or early lunch (depending on your body clock) – call it mid-morning, and with a healthy flying list to work through, we got the toys out. 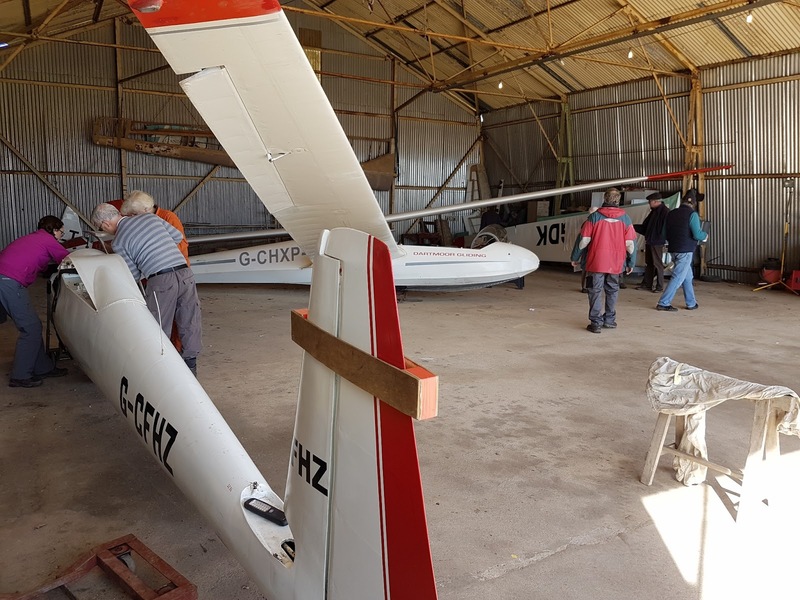 With Roger Appleboom on hand to assist we alternated in flying members Phil Sellwood, Chris Owen, Dave Downton, Bob Sansom, Robin Wilson and Jorg Beasley, not giving check flights as such, but enabling them to regain currency, whilst also searching for wave. Launches to 1,400ft certainly put us in the zone, and reduced sink was commonplace, but with no clouds to mark the lift searching to the north proved unproductive. It was not until mid-afternoon when ‘wave tactician’ Bob Sansom launched, with his ‘remain over the winch and circle’ technique that positive results were obtained, taking him to 2,600ft in a little under 30 mins. 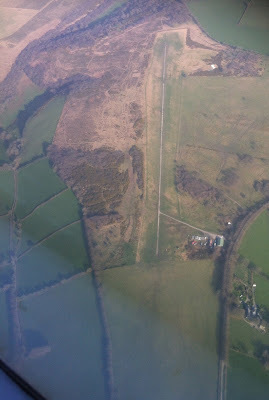 All our flights today came with a ‘health warning’: beware the wind gradient and have plenty of height in hand on your final turn, a warning which was heeded by all – even with a 700ft final turn the landing run could be brought to a halt well before the west end windsock. whilst Chris Owen hooks on. 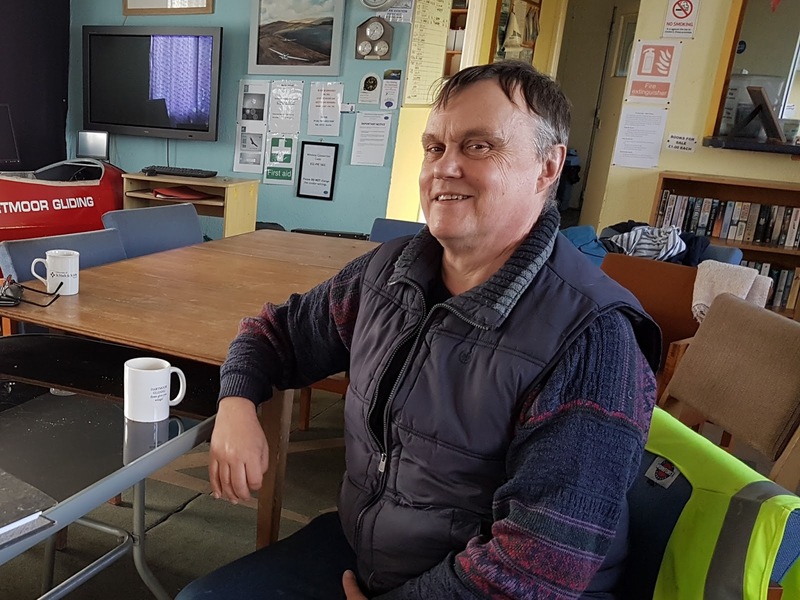 It was really good to see returning member Dave Parker on site today, claiming that the boredom of a 10hr out and return to his honeymoon in the Caribbean had driven him back to us for some excitement – I think we ticked that box! 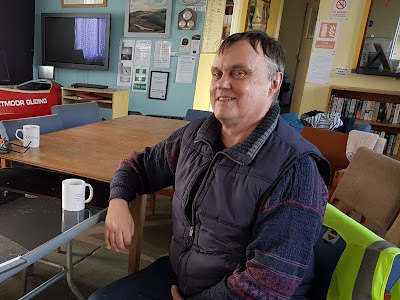 We also welcomed a visit by ex-member Steve Clark, recently returned from flying in South Africa. 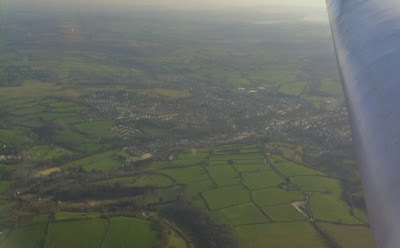 The airfield from 3,000ft, looking east. So what’s all this ‘reassuring dependability’ stuff? Well, as previously stated, with no clouds to mark the wave, when Jorg Beasley took the last cable to launch ‘into the zone’ all that could be relied on was the folklore (or received wisdom if you like), that in an easterly the wave lies “between the winch and the sugar factory” (that’s folklore, not wisdom!) And so, with the vario moving up to zero, that’s where we went, reaching 1,500ft overhead the sugar factory at the end of the first beat. On Beat 2, with the vario needle remaining stationary but the faintest, slow beep coming from the audio, we got to 2,000ft. Turning back into what appeared to be into wind (from the SE), with Beat 3 we progressed to 2,500ft east of Tavistock and, on our fourth beat, eventually made 3,000ft back over Blackdown. Now that’s reassuring: – you can’t see it, but at some time in the distant past someone at the club told you that and, when you went ‘looking’, there it was… dependable as ever. And so, as Eighties super soul band 'The Whispers' would say, "...the Beat Goes On..!" Except we didn't, preferring to break off (not wishing to be met by a mutinous horde desperate to get home on our return); but we could have continued - to who knows what height? Jorg Beasley about to break the 3,000ft barrier. Thanks go to Dave Downton and Robin Wilson for winching, and to all attendees for their patience and teamwork in today’s testing conditions. On Friday evening as the temperatures lowered the sky was full of lenticulars and wave bars showing the presence of a large wave system. So an early trip to the airfield on Saturday was the order of the day. The sky was blue, keeping any wave effects a secret but the air was alive with gusts ( rotors? ). 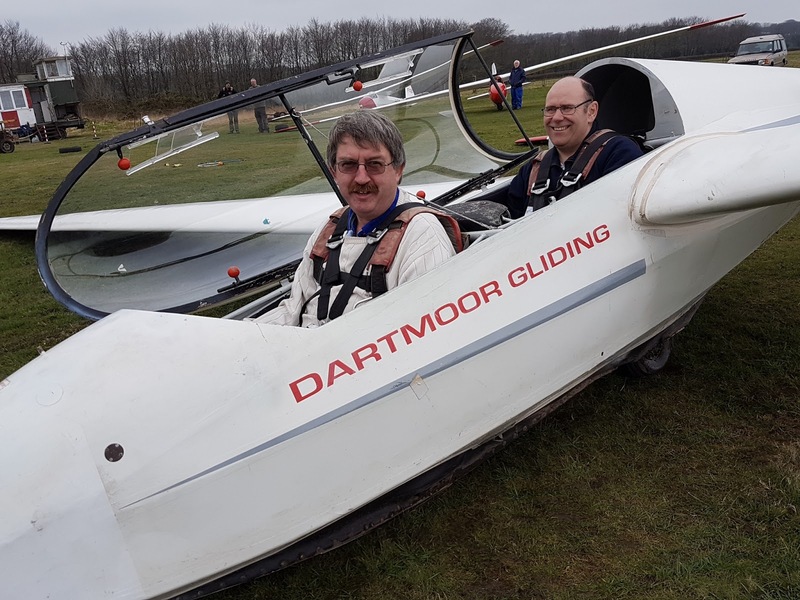 After checking all the weather forecasts and visiting both ends of the runway, instructors Ged and Rick decided that today would be a non flying day. Apparently the wind was very gusty over the airfield and the 40 knot winds forecast for later in the day would make the day too challenging. Later the windsock showed the wisdom of this difficult decision, waving almost fully vertical before hanging limp and then sitting perfectly horizontal. If you looked from the side The windsock pole was trying to bend under then strain. 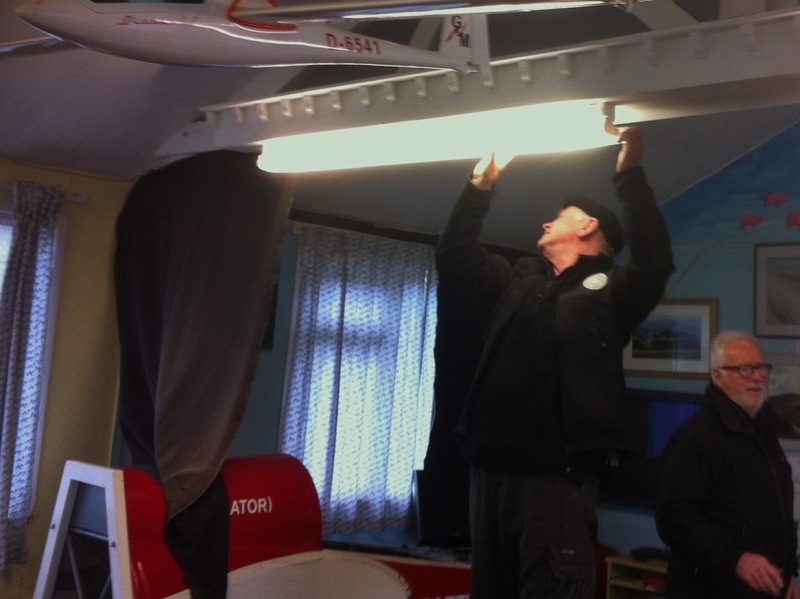 In the hangar, after Colin had adjusted the canopy on HXP, he helped Paula and Peter with the CofA on their K6. A disappointing ( or should that be "character forming" ) day. 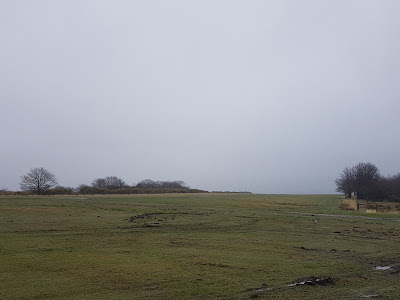 Another Sunday of low cloud, intermittent rain leading to increasing wind which, coupled with ground that remains waterlogged, meant no flying today. So, with the list of practicable tasks reducing, what was there to do? How about a welcome return of the Sunday Soarers traditional breakfast?? So, for those not watching their waistline too closely, Paula Howarth was despatched (well, volunteered actually) into Tavistock, returning within the hour with all requisite ingredients, including black pudding, herb sausages and free-range eggs (for scrambling). The Three Breakfasteers: the return of a Sunday Soarer’s tradition. That (almost) gave Rich Roberts time to polish out a few blemishes on the starboard wing of his otherwise immaculate Discus, whilst Dave Downton got on with some rather more fundamental fettling of the club’s borrowed K-8. Rich Roberts polishing the mainplane of his Discus. Our ‘new tractor: a David Brown 9905. There was also some discussion about the launchpoint air-band radio, and whether it would become illegal when the new 8.33kHz spacing comes into force next year, and the rather inelegantly named airspace ‘grab’ being proposed by Exeter Airport, a link to which is here. Although Spring has officially arrived ( met office ) today was much more like a winters day. Low cloud, squally showers a strong westerly gale, and the generally wet state of the runway, made this an easy non flying day. Step forward our overall clad duo, Rick and Scratch who bustled around changing the brushes in the generator ( who knew that was even a job that needed doing ? 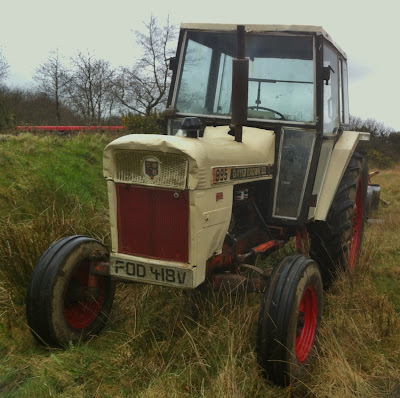 ), replacing the brake pads in the ML1 winch and fixing the hand throttle in the tractor. Thanks chaps. 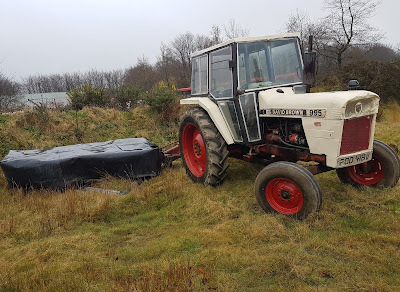 We noticed that the promised loan backup tractor from Phil has arrived. Did he drive it all the way from home? After several phone calls we managed to bring the committee meeting forward and spend the afternoon discussing the club business and it's future. Readers of a certain generation, and viewers of a slightly younger generation, will remember that ‘Dennis the Menace’ was frequently outwitted by his rival ‘Walter the Softy’. Today it was Brentor the Softy which outwitted us – an early morning inspection of the field, and in particular the 7-tonne winch, led us swiftly to conclude that to risk moving the winch to the upwind end of the runway (yesterday’s team having managed 23 launches in an easterly direction) was so fraught with potential for getting bogged down that it were best not moved at all. Not only that, but the ‘softyness’ of the field could easily have led to the same result with the gliders, plus the damage that Discos would have caused… Not that the aerial conditions were all that inspiring, as the low cloud base lifted to be replaced by a strengthening wind from the NW. The weather forecast was: soft. Too soft to move 7 tonnes of winch. So it was back to the clubhouse where Dave Downton, Rich Roberts and Adrian Irwin were busy flying the ridges at Denbigh and the Mynd (courtesy of the simulator) whilst Sean Parramore and Chris and Karon Matten found time to come and check on their steeds in preparation for the coming season (Adrian Irwin also spent time programming in stations to his new 8.33 kHz spaced VHF radio – lucky chap! - these radios are mandatory from Jan 18). Ed Borlase and Roger Appleboom lower the windsock at the start of the day. But what of the ‘core’ team? Were they dismayed? Well perhaps slightly, but with referral to the ‘To Do’ List they were soon highly ‘inspired’ to get ‘wired’ thus generating income for the club by collecting up last year’s used winch cable ready for despatch to the scrap yard. 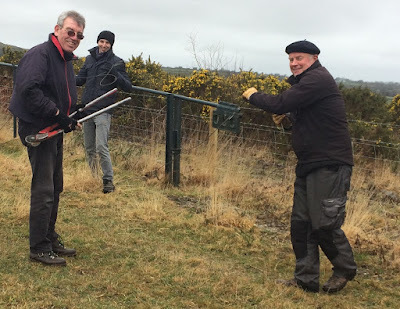 A simple task, you would have thought, winding cable around your thumb and elbow; and you’d be right (hence this choice of those with the right skillset for the job..! 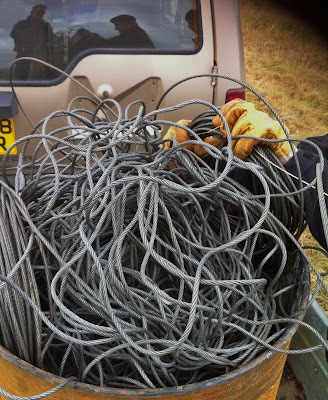 In the months that the cable had been lying on the ground, however, not only had the grass grown over making it difficult to extricate (cue Range Rover Discovery) but the cable itself had procreated! Thus the single strand we tugged from the tufts at the east end of the airfield mysteriously became four or five strands as we worked our way westward – and the youngsters – although shorter - were distinctly plumper and more difficult to control than their parents! Did this deter us? 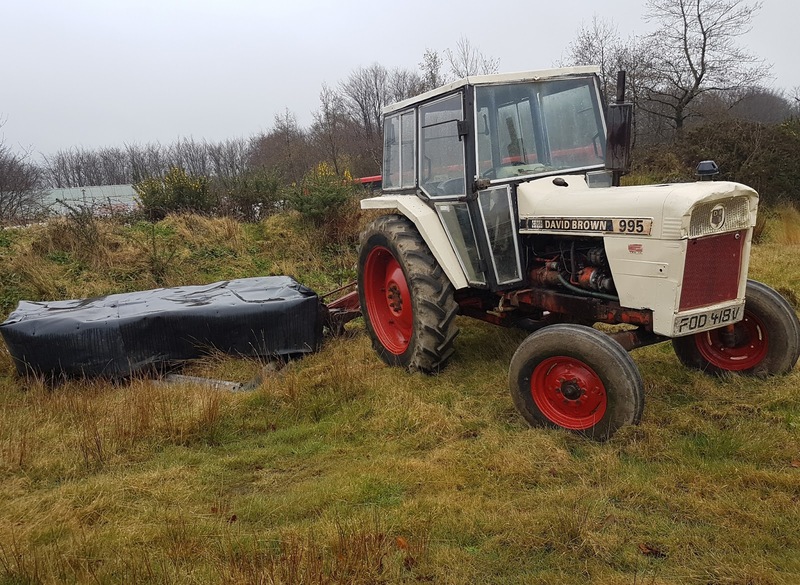 I’m afrayed not – although the oil drum was positively overflowing by the time we’d finished! Zees ees ‘ow we tame the snake en France! Roger A in typically gallic garb. 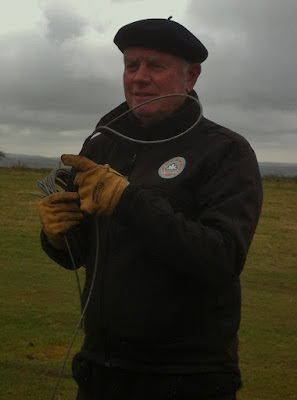 The finished article: Roger Appleboom (see reflection) loads the final coil of wire into the oil drum. There are signs of spring everywhere with swathes of brightly coloured daffodils and large magnolias making their stunning appearance the darkest street. 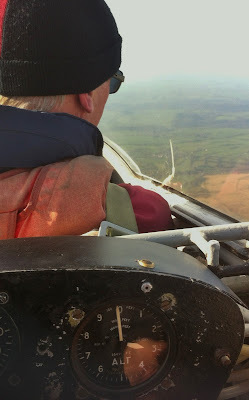 So with building high pressure the possibility of a good day's flying was overpowering. However, today started out with eight eighths low grey cloud seemingly caught under the high pressure. At the airfield, though, the members, led by Mike Slogett, today's instructor in charge, were not going to be denied. Their steely determination to fly was only matched by the steel, grey clouds. If the cloud base was too low then cable break practice would be the order of the day. The fleet was awoken from it's slumber in the hangar and prepared for a busy day. 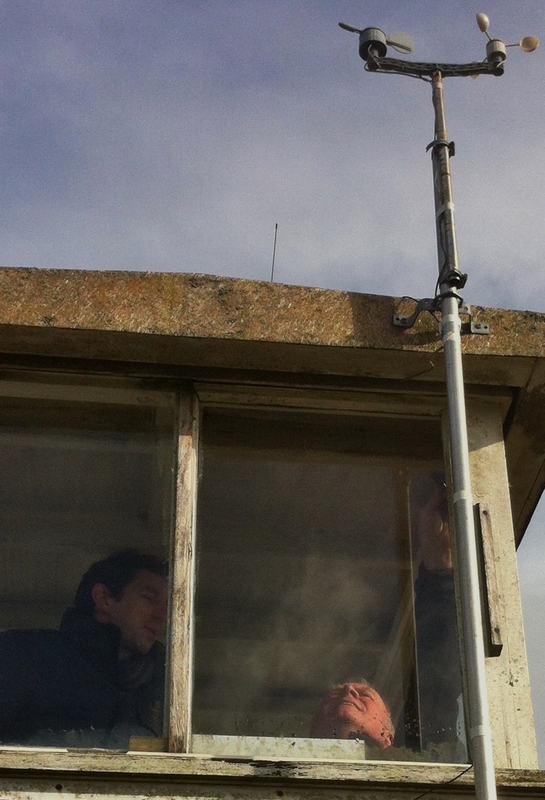 By 11 am the cloud was at least high enough for circuits to be flown and the flying started. I would like to report that the cloudbase continued to rise alas this was not to be. At best, a flight could get a full height launch. At times the lower cloud saw launches releasing early. All the pilots coped easily with the variable conditions and the plethora of practice cable breaks. This gentle looking team would not be denied. 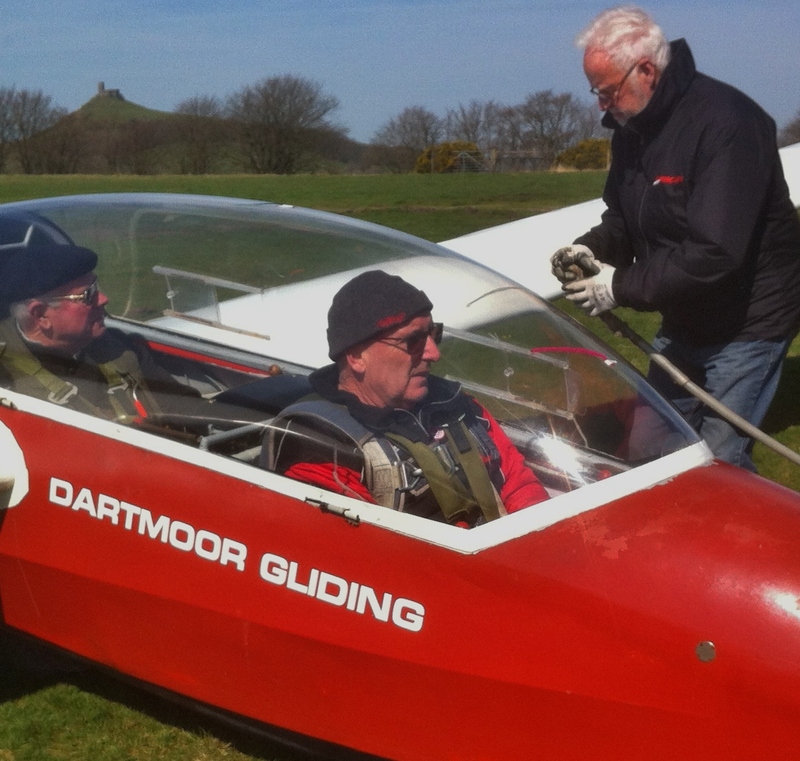 We had a visitor today, Jonathan Salisbury, who, with his son George, was hoping to get some air experience flying. We waited for the conditions to improve and when the cloudbase lifted a little Johnathan had his first ever flight in a glider. 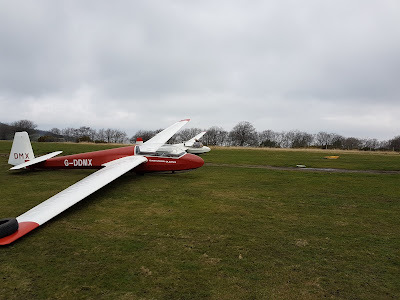 However, conditions soon deteriorated again so John and George will be back soon to complete their introduction to gliding. The day finished early with the cloud base lowering once more. The gliders needed, and got, a good wash before returning to slumber in the hangar waiting for the next opportunity to flex their wings. In the 72 hours preceding today there was general consensus between forecasts that low pressure centred over N Wales and an associated occlusion passing across the SW peninsula would make flying impossible. In the event, the widely predicted low cloud, gusty wind and sharp showers didn't fail to 'disappoint'. But just how windy was it? Arriving at the launchpoint we found that the weather station was steadfastly recording 19.8kts. This, as the wind whipped around the hut flinging handfuls of hailstones through the open door, defied common sense. So something was amiss. 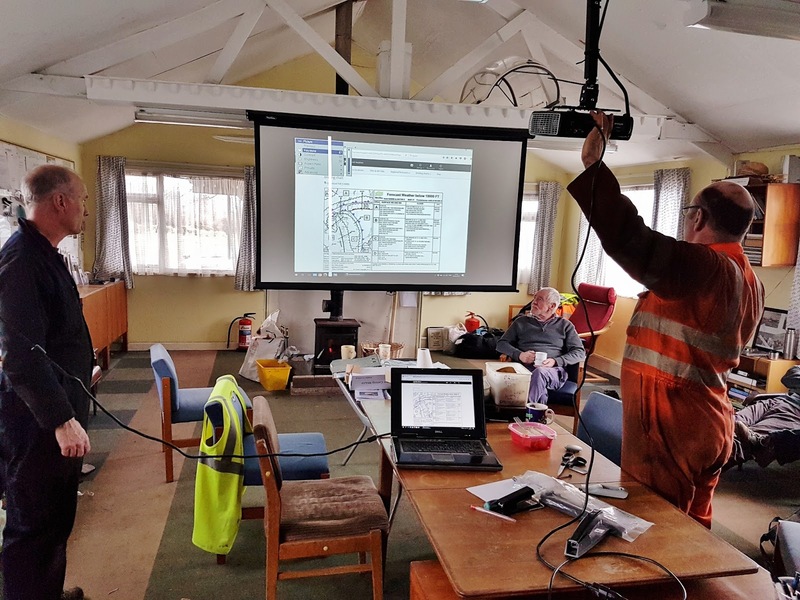 The monitor, which was correctly displaying the time, clearly was not at fault, so Roger Appleboom and Ed Borlase went aloft (well not into the sky, just the logkeeper's position) to investigate further. Whereupon they discovered that the transmitter, having continually transmitted information since the weather station was installed a year ago, had a set of dead batteries. A trio of AAs was required. Now most gliding clubs have spare 12V glider batteries and suchlike ready and waiting to go, but as for the humble AA... Well, we found one with a charge amongst a bunch of duds in the Tech Office, but that left two Situations Vacant. Fortunately, the ever resourceful Ed Borlase then appeared with two 'birds in hand' (their bush closely resembling the remote from the music centre!) and so we were back off up to the launch point. 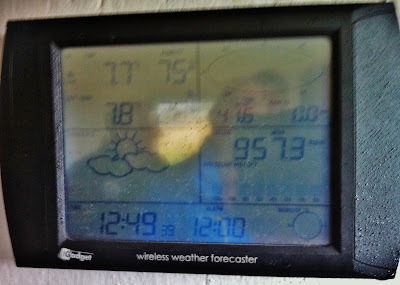 Once electrical connection had been established the weather station positively leapt into life, the screen glowing green as each new input was received... 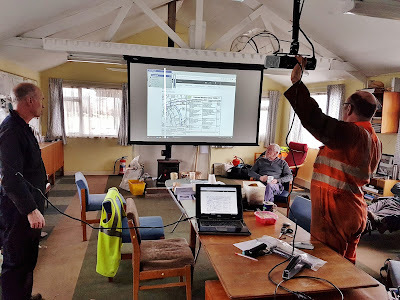 Eventually, once we had witnessed the screen record a windspeed of 41.9kts and thus were able to conclude that the instrumentation was in fact doing what we already knew to be the case, our return to the clubhouse was fully justified..! ...which then recorded 41.6 kts! After tea and 'Breakfast Two' (yes, Richard Roberts had arrived*), we gave the overhead projector and drop down screen an unofficial opening, with some instructive videos on aerotows and spinning courtesy of You Tube, following which those intending to go soaring at Denbigh (aka Lleweni Parc) later this year studied You Tube postings from this interesting location. 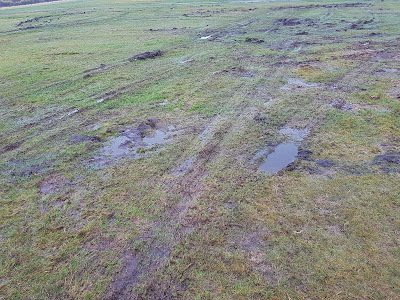 The rain over the last few days has made the airfield very wet. This and the very gusty wind and frequent showers made this a non flying day. 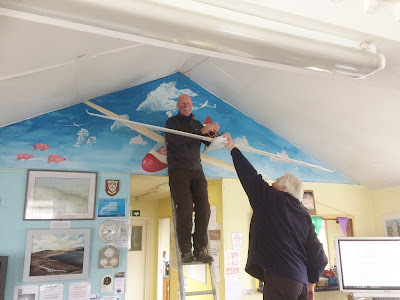 In the clubhouse, a small crew set about moving the model glider and fitting the new screen and projector to enhance our lecture and video facilities. 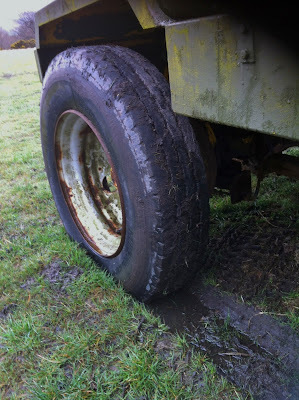 After this Rick and Scratch disappeared to the hangar where the ML2 winch received a full service of the braking system. Judging by their black faces when they return to the clubhouse later this was a very mucky job. 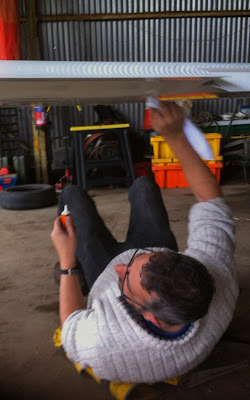 We did have a visitor today, David Archer, came to check us out prior to flying with us when the weather improves. Hopefully the weather with let us fly soon. Q1. 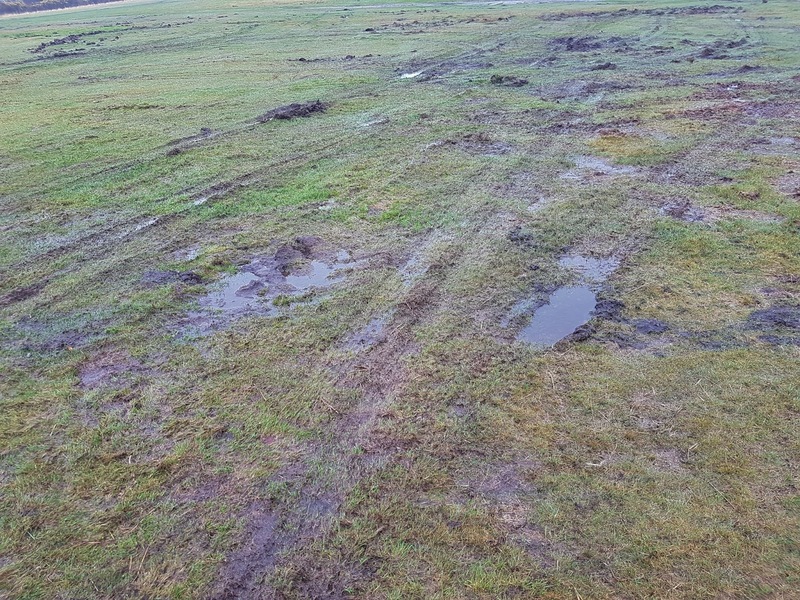 What meteorological conditions may prevent safe flying operations at your club? a. Low cloud b. Precipitation c. Gusts and Crosswind d. All of the above. Q2. In the event of such conditions, do you? a. Press on regardless b. light the fire and make tea/coffee for all on arrival c. look forward to working up answers for your Bronze ‘C’ exam d. All of the above. 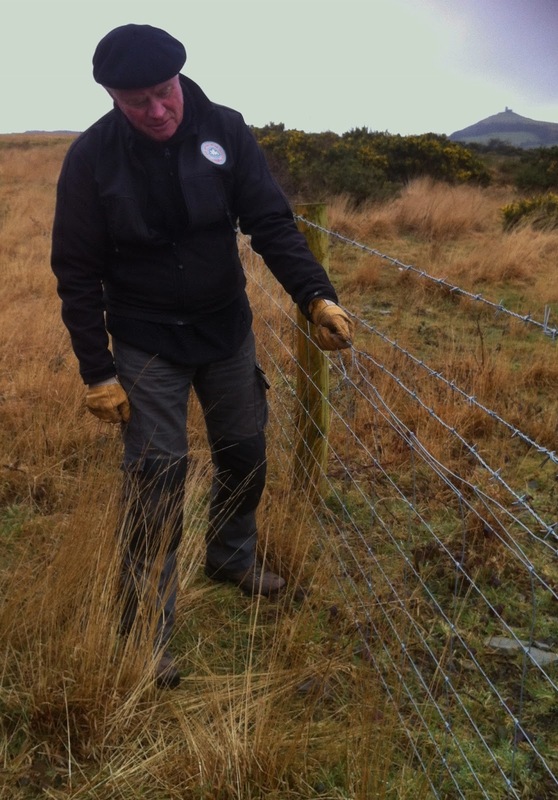 Roger Appleboom at the east end making a permanent repair to the fence. Q3. Having spent a good 90 minutes working on the exam do you? a. Look for other useful jobs that can be done, such as hoovering out the gliders b. Make more tea for late arrivals such as Roger Green c. Take pity on the overhead lights by emptying hundreds of dead flies from them d. All of the above. There’s no flies on these grounded fliers..! Robin Wilson, Dave Downton and Roger Appleboom emptying the light diffusers. Q4. On completion of all this hard work do you? a. Survey the weather again and conclude it’s even worse than before b. Make even more tea and listen to Roger Green’s spine-chilling dits from his hang gliding days c. Realise that there’s a strong possibility of watching England give Italy a drubbing in the Six Nations and so go home feeling satisfied that you’ve done some good for the club on a rubbish day d. All of the above. Thanks go to Roger Appleboom, Dave Downton, Pete Harvey, Chris Owen and Roger Green for all of the above, which does in fact conceal a serious tip if you are studying for your Bronze 'C’ exam. Got it, yet?